Many of us end up with some unsightly scratches on our vehicles, and it can seem daunting to take the time to fix even minor car scratches. Let’s make car scratch repair less daunting with a few cosmetic car repair tips and tricks from yours truly at Liberty Collision! Some small cosmetic damage to the body of your car seems like a car repair that can wait. The most important thing to drive a safe, fully-operating vehicle out on the road. Why is it important to repair car scratches on your car sooner rather than later? One of the biggest reasons to fix car scratches is to prevent rust on your car. A deep scratch can reveal the metal of your car to the elements, which leads to rust. Identify and clean the car scratch areas for repair in your Reno home. The absolute first thing you will want to do in your car scratch repair process is make sure what you see is in fact a scratch! In small collisions like fender benders, some paint from the other car may be left on the surface of your car. This is an easy fix! Before you repair scratches on your car, prepare your garage area to make the repairs. If you are repairing car scratches while outside, make sure it is not windy and kicking up dirt. The dirt can get on the surface of your car and cause more scratches as you try to repair the initial scratch. Clean your car around the scratch so you also have a clean and dry working area on the car’s surface. 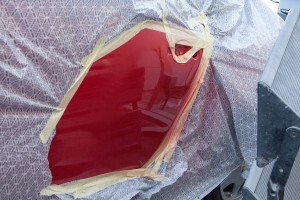 Your next steps in your DIY car scratch repair process are sanding down and buffing the scratched area. Sand with the grain of the scratch to avoid making the scratch have ridges, which can make this cosmetic car repair more complicated. Be sure to rinse off the area every once in awhile as you sand it down to make sure you have sufficiently sanded down the scratch. Once the scratch is sanded down, you even out the sanded space by using a buffer and a rubbing compound. This step helps you make sure you have an even surface before you wax the area. You don’t want your one sanded down scratch to look like a bunch of small scratches in the sunlight! The even look makes a big difference. Now that you’ve repaired the scratched area of your car, you use wax to make this spot look like the rest of the car. Waxing is imperative at this point so that this area can still repel water. Give some love to the rest of your car as you wax the previously scratched area, since waxing your car prevents paint chips and dirt being embedded in your car’s paint. Car scratch repairs at Liberty Collision in Reno. At Liberty Collision auto repair shop in Reno, our team can take care of car scratch repairs, paintless dent repairs, windshield replacements and more! Our car scratch repair process is efficient so you can get back on the road quickly and feel good about the appearance of your car at the same time. Stop by Liberty Collision today for an estimate on your car scratch repair!